I am learning so much from having this blog. I feel very grateful for the exposure to other cultures that this platform provides. My second source of inspiration is from Parul Singhal, from her recipe Aloo Mutar Masala, posted earlier. 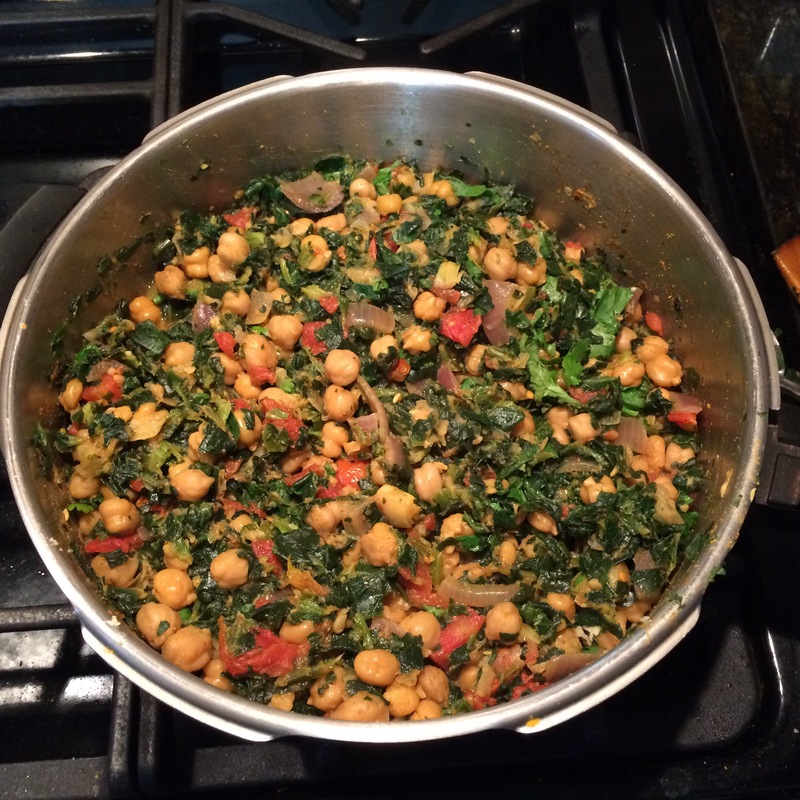 Essentially, I used the same method and seasoning from Aloo Mutar, substituting spinach and chickpeas for peas and potatoes. I am hoping that this will be still relatively authentic. I made some adaptions, to accommodate more readily available local ingredients. 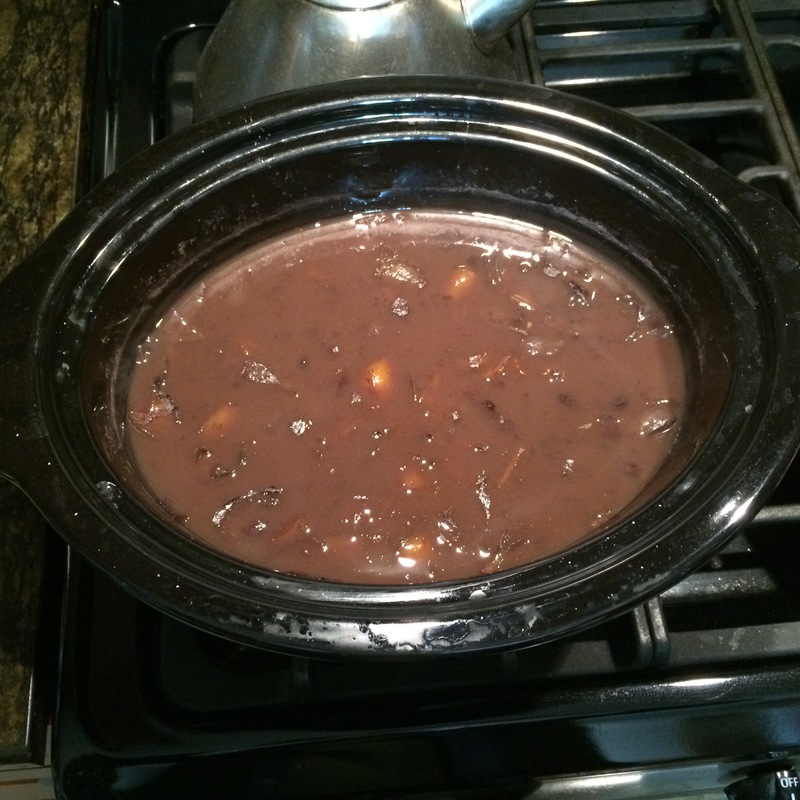 Water to cover, or water to beans in 3:1 ratio if using pressure cooker. Today, I had chickpeas already prepared. These instructions would also work if using canned chickpeas. Step 1: Sauté onion, fresh ginger, cumin, turmeric, coriander, red pepper flakes, salt, until fragrant. Add chickpeas, tomatoes and water. Simmer to blend flavors. Step 2: Add spinach, garlic, and garam masala and adjust seasoning and heat through. Step 3: Before serving, add chopped cilantro. 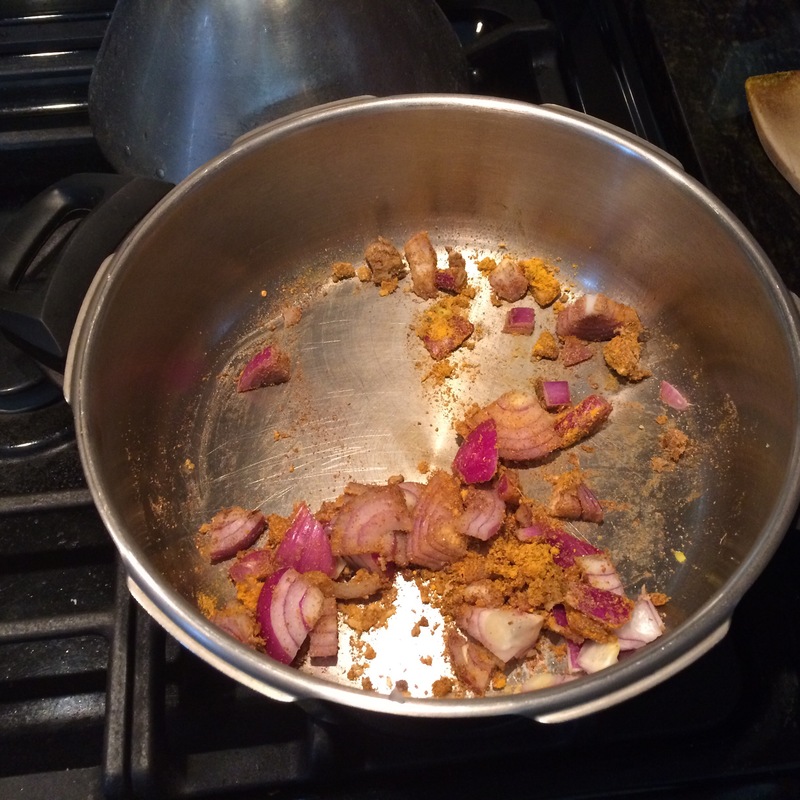 Stove top: Sauté onion, fresh ginger, cumin, turmeric, coriander, red pepper flakes, salt, until fragrant. Add chickpeas, tomatoes and water. Bring to boil and let simmer until done. Add spinach, garlic and garam masala and adjust seasoning. Pressure Cooker: Sauté onion, fresh ginger, cumin, turmeric, coriander, red pepper flakes, salt, until fragrant. 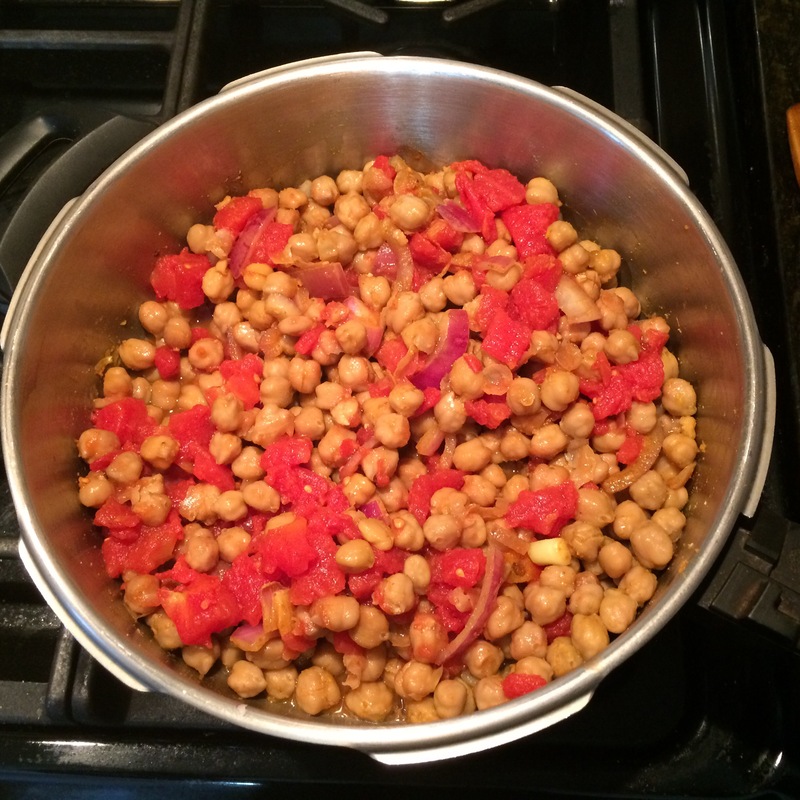 Add chickpeas, tomatoes and water and cook for 40 minutes to pressure and then release the pressure quickly by running cold water over the lid when done. Add spinach, garlic and garam masala and adjust seasoning. Crockpot: Sauté onion, fresh ginger, cumin, turmeric, coriander, red pepper flakes, salt, until fragrant. 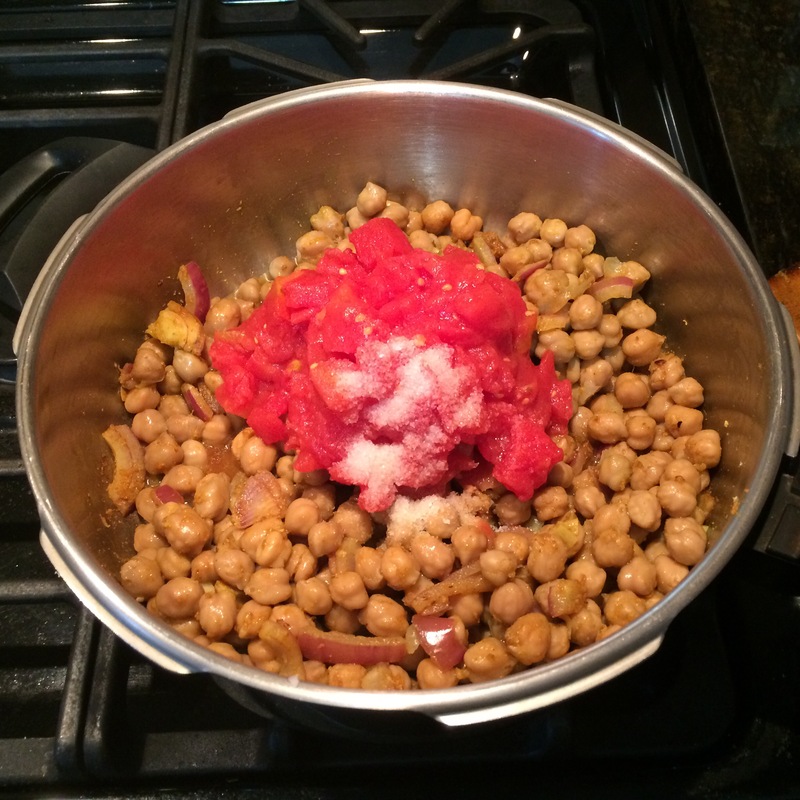 Add chickpeas, tomatoes and water and place in crockpot. Cook on low until beans are cooked. Cook with enough water to cover the beans. 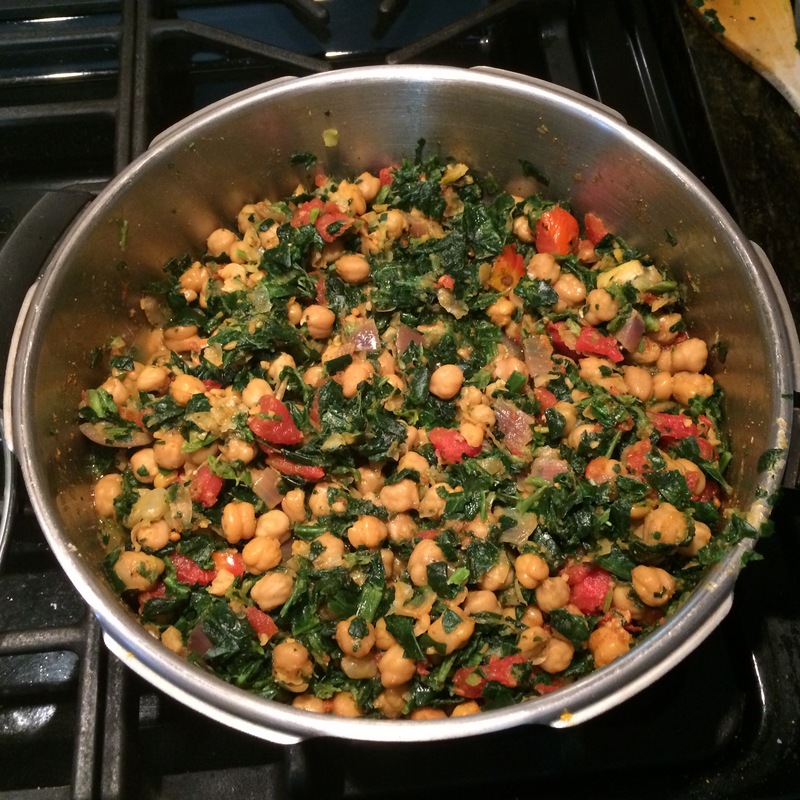 Add frozen spinach, crushed fresh garlic and garam masala and adjust seasoning. Before serving, add chopped cilantro. My husband said, “Wow! This is awesome! Throw that on a bed of rice, and we have delicious!” So, I consider that to be a vote of confidence. I suspect that fresh spinach would bump this up to an even higher level of culinary excellence, but, I am time challenged, and I have my limits. Even more incredible, I never could have done this prior to blogging. This has opened me up to a whole new world! Amazing! Thank you Gloria and Parul! I hope that I did your recipes justice! Today was my husband’s Hebrew birthday. Given our past year, we feel very grateful to celebrate it together. 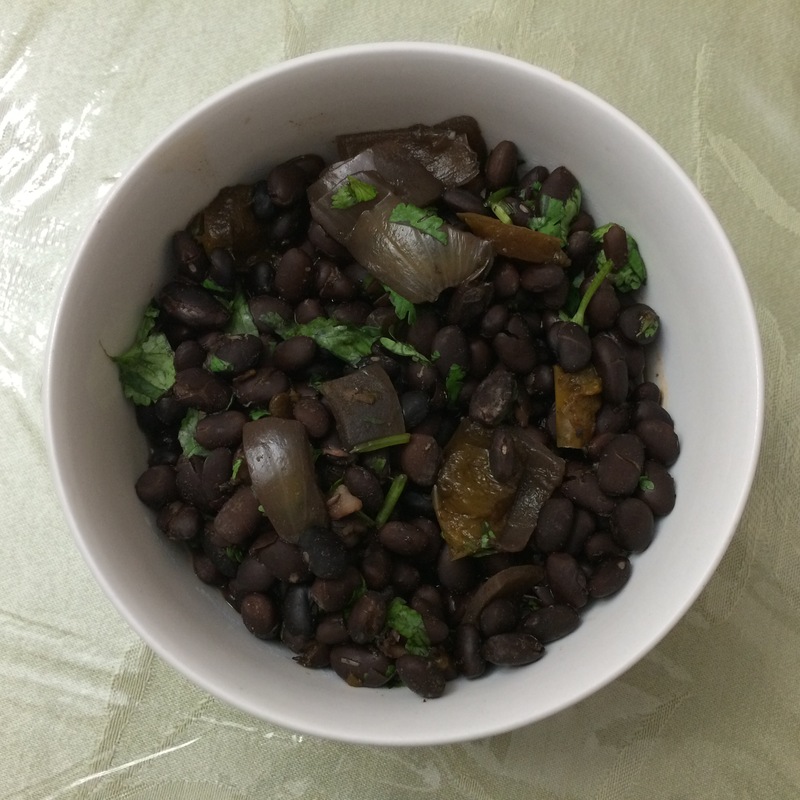 Jay made a special request for something with black, kidney or lima beans. I am happy to say that I think that I hit the jackpot on this one! Soak beans overnight. Ideally, I recommend sautéing the onions and peppers. Then, add the spices and beans and sauté until fragrant. Add water to cover and simmer until done. Adjust seasoning. Fresh cilantro before serving adds a special gourmet touch. This morning, however, was time challenging morning. I did not have the time to sauté everything first. Instead, I placed all the ingredients into the crockpot and it cooked on low for the day. This could also be made in the pressure cooker, 24 minutes to pressure, unsoaked, quick release method. This is from Miriam via my friend Malka. My kids LOVE them. Truthfully, I have yet to master making them as well as my friend. Fortunately, she is very generous! Mix together the sugars, oil, vanilla and eggs. Then, mix in the flour, baking soda and salt. 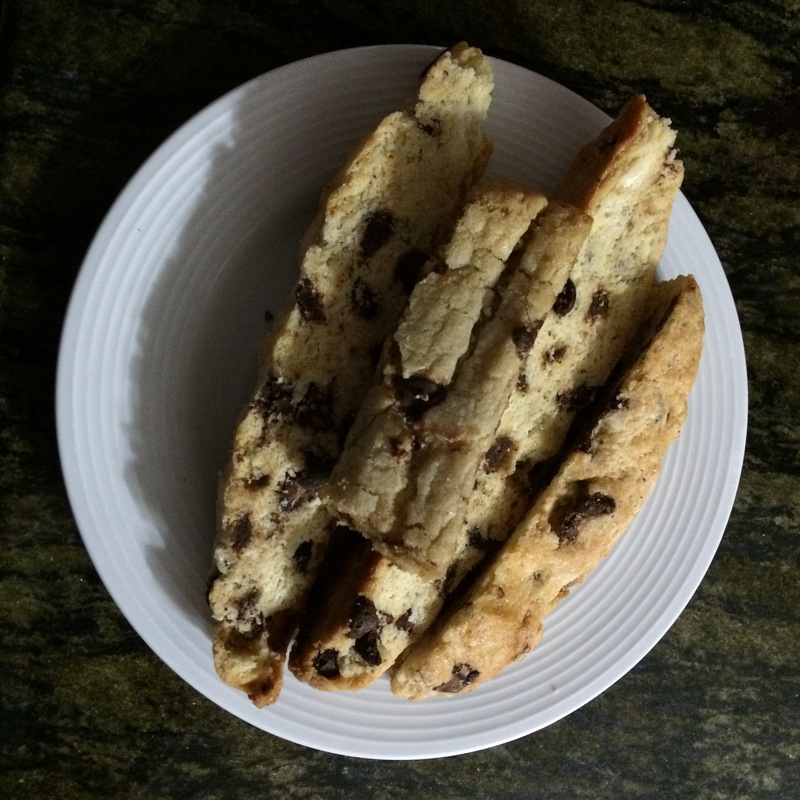 Bake on parchment paper on a cookie sheet and form into 2 flat logs. Bake for approximately 18 mins. Cool for 10 minutes and then slice. Here is a picture, with a shadow unfortunately. 1 T soy sauce — I use tamari to make it gluten free. This is very easy and always comes out great. I like it because I don’t have to taste it and do any adjusting of the seasonings. It is a tried and true recipe. As a working mother, I try to make refrigerator cookies. I make the dough, freeze it in logs, wrapped in parchment paper, tin foil and then put them in a zip lock bag. Then, I bake them when I have time later, as needed. Cream together oil, sugars, and then add eggs, and vanilla. Add the flour, baking soda, salt and cinnamon and pulse the food processor until just blended. Stir in rolled oats and pecans (if using). Shape the dough into rolls, and wrap in wax paper. Refrigerate until firm or freeze until ready to bake. Bake in preheated 3500F oven. Slice dough ¼ inches and arrange on cookie sheets, lined with parchment paper. Bake 9-10 minutes until lightly browned. Cool on wire racks. These freeze well. Yield: about 5 dozen cookies. This is the best recipe ever! Cream together oil, sugar. Stir in vanilla and eggs. Add cocoa and flour. Stir in nuts and chocolate chips. Pour into greased 9 X 13 inch pan. Bake in a preheated 3500F oven for 25-30 minutes. While still warm, slice into squares or bars. Blend sugar, and oil. Then add eggs and vanilla. Blend. Add the flour and cocoa and gently pulse until just blended. Mix by hand the nuts and chocolate chips. Bake and cut into squares while still warm.